When it came time to recognize high-achieving students at James Madison University’s College of Business this spring, JMU named Jonathan Leaman and Darian Harnish – both 2013 graduates of Eastern Mennonite University – as two of four award recipients from a class of 80 students earning a master of science in accounting. Leaman was one of three students selected as Outstanding Graduate Students in the accounting program. 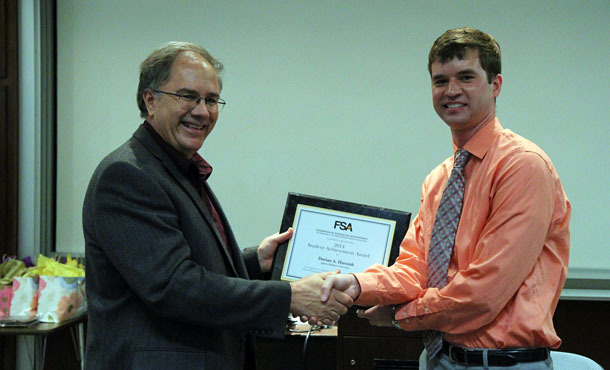 Harnish was awarded the Federation of Schools of Accounting (FSA) Outstanding Masters Student award, an annual honor conferred at FSA full-membership schools to fifth-year students in master’s degree programs. Leaman plans to sit for the Certified Public Accountant (CPA) exam in July and begin working at Brown Edwards & Company, a Harrisonburg public accounting firm, as a CPA by the start of August. Harnish too will be starting a job this summer. In July he moves to Baltimore, Maryland, where he will begin working at the Baltimore office of McGladrey as a tax associate. Harnish was one of 87 national FSA award recipients, according to the FSA website’s 2014 list of recipients, but each FSA member school establishes its own award criteria, making each award a unique honor. This year’s JMU FSA award recipient was selected for his promise as a future PhD-holder and possible faculty member. In response to the award and his future plans for his education, Harnish said he expects to pursue a doctorate five to seven years from now, after working in public practice. The JMU College of Business accounting program faculty selected the four accounting students for recognition at this spring’s graduation. Leaman, Harnish and the other two students received their awards in a pre-graduation ceremony on May 8. Leaman and Harnish both graduated from JMU this past month with master’s of science degrees in accounting – Leaman with a concentration in taxation. Harnish graduated with a dual degree in accounting and economics while Leaman was an accounting major and economics minor. By taking summer classes and full course loads for two semesters, they were able to complete the master’s degree program at JMU in just one year.